Even while still in the crib, your little one will need proper footwear. That means that a lot of your attention should be focused on booties. That being said, you should find a pair or more of booties that are comfortable and also look cool. Infants and toddlers alike need their little feet well protected, and, if you want to add a playful aspect, too, you can choose from the models available that combine excellent quality with quirky designs. Parents can grow annoyed with socks that always come off their infant’s feet, and that can easily be solved if they opt for the goumikids Goumiboots. These cool looking booties stay on all the time, due to the unique closure system used by the manufacturer. The straps never come off, and the booties are totally slip-free. These beautiful booties are ideal for a newborn, and they will help to keep their feet warm all the time. The breathable material is practical, and it will allow your baby’s feet to breathe and maintain cool in hot weather, as well. There is a well-known recommendation coming from healthcare professionals regarding how you should keep your baby’s feet for the healthiest development. All agree that barefoot is the way to go, but, if you still want your baby to wear booties, choosing models with soft soles is highly advised. This soft sole model is exactly what you are looking for. 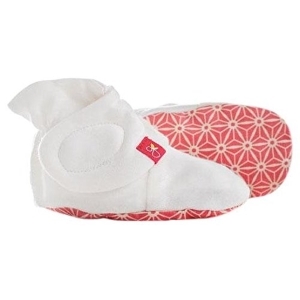 The booties are durable, as they are made of leather, and the suede soles are soft and flexible so that you baby can continue their healthy development. The booties will remain on the baby’s feet, as the elasticized ankles will not allow any mishaps. 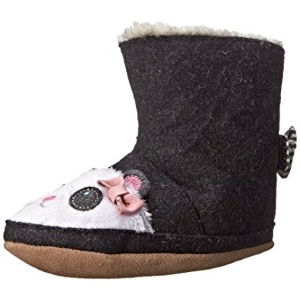 If you are looking for a pair of fashionable booties for your little one, look no further than this model. Growing kids will need proper footwear and going for a classic design is always an option. The Vans Kids’ Sk8-Hi Zip-K sports a well-known design and you may love it just as much as your kid. The canvas upper will let the little feet breathe and overall, these booties are very fashionable. If you are among parents who prefer to keep their little ones in fashion just as much as they keep themselves, you will not go wrong if you decide to buy these. 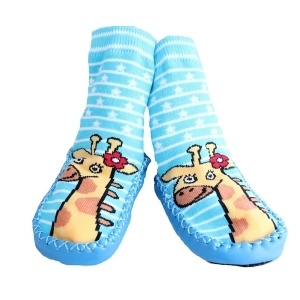 Soft soles are a requirement for booties created with the needs of infants and toddlers in mind. While adults have no issues with using hard sole footwear, babies need soft soles so that the natural development of the bones and tissue in their feet is not hindered by anything. These baby booties have the approval of the American Podiatric Medical Association, which means that the natural function of your little one’s feet will not be affected. The soft soles bend and flex as much as needed, and it is safe to say that your baby will feel as good as they will feel by playing around being barefoot. These wool booties are ideal for infant girls and will bring a smile on parents’ faces, as well. They are made of a combination of textile material, faux fur, and leather. The soles are made from leather, and they are very flexible, as they can bend easily. That means that the natural development of your baby’s feet will not be affected, and you can enjoy having your little girl wear quirk looking booties that cover not only the feet but also the ankles. The quirky design is what makes these booties an instant hit with parents, and it may explain their high popularity. 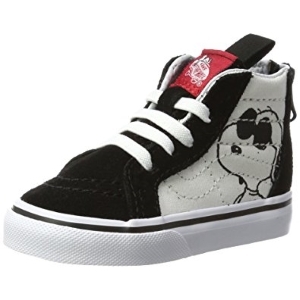 These cool looking sneakers for baby boys and baby girls are made from top quality materials, so they are very durable. The material used is canvas, and it allows your baby’s feet to sit comfortably. Make sure that you pick the sneakers needed for the age group. 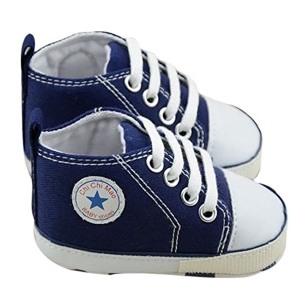 The manufacturer offers these sneakers in three sizes, one for babies that are between three and six months old, one for babies aged 6 to 9 months old, and one for babies that are aged from one year to one year and a half. The sneakers are unisex so that you can buy them for either boys or girls. A model made for little girls, these adorable socks with skid-free soles will catch your attention and your heart from the first glance. The socks are made from terry cotton, and they are very comfortable. The soles will not allow slippage, as they are made from artificial leather. If you have laminate floors in your home, and you want to reduce the risk of accidents for your little one, while keeping their feet warm, these socks are everything you need to buy. Infants and toddlers can wear these socks and feel comfortable all year round. The moccasin design is very appealing. 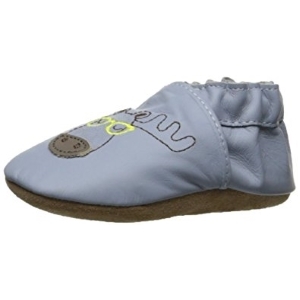 These booties have soles made from real suede, and the soft, flexible feel will make your kid comfortable all the time. Infants can wear them almost regardless of weather, except for very chilly winters. The soles are designed to be skid-free, to avoid slippage. Your piece of mind is assured, while your little one can walk and play without fear of falling. The elastic ankles make sure that the booties remain in place, and the uppers are ventilated properly to ensure breathability. That means that the baby’s feet will always be cool and dry, for maximum comfort. These booties meant for baby boys are made with leather soles and uppers also made from leather, for comfort and durability. The way they are designed qualifies them as a solid choice, and it must be noted that they are approved by the American Podiatric Medical Association, for allowing the natural function of the foot to develop. The uppers are well ventilated, so you don’t have to worry that your baby’s feet will suffer chafing or other unpleasant things due to excessive moisture. The leather soles are textured, so there will be no fear of slippage and the elastic ankles prevent the booties from coming off. Do you want your little one to be one of the Justice League supporters right from the get-go? The booties are made from a combination of fabrics and synthetic materials. 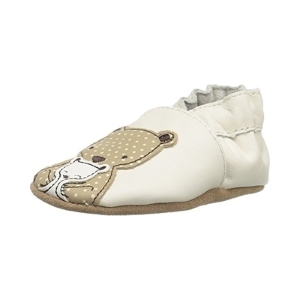 It must be said that these crib shoes are officially licensed, so you will know that your little one wears the real thing. The embroidered logo tells you everything you need to know about these slippers. 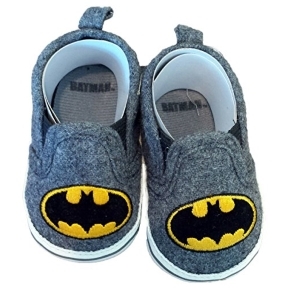 They would be the slippers that even baby Batman would wear. 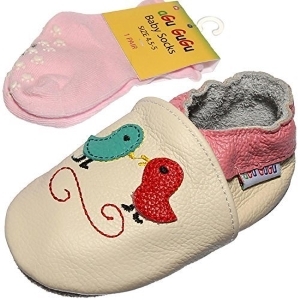 The booties are made from durable materials, and they are cute and cool, at the same time. New parents are usually extremely excited, anxious, and worried regarding the birth of their first child, meaning they will put in an extra effort and will often go over the top to make things perfect. From ultra-luxurious baby rooms to lavish baby showers and expensive clothing, parents want to do the best for their children and often enough overwhelm the babies with love, affection, and material goods. Nevertheless, they also do this because they want to make sure the baby has everything and will grow up in a loving environment, with all the necessary potential for a harmonious childhood. If you are looking for cute and comfortable baby clothing, we are sure you already have more than a thousand stores in mind. You may have probably rushed into a shopping spree and bought clothes to last up til the baby’s high school graduation. However, a good pair of shoes will never do harm. If you don’t have the time to search for the right type of shoes for your newborn or simply cannot decide from the wide variety of products available, we have compiled a comprehensive shopping guide to ease your decisions. Let’s face it – is hard to resist temptation when all you have in front of you is an endless supply of adorable baby shoes. Pink, blue, made from the softest fabrics, with adorable embellishments or perfect miniature replicas of the world’s famous models – these all could prove problematic if you are searching for only one pair. In order to make the shopping process easier and more budget-friendly, we suggest you only buy shoes related to their utility in the near feature. Nevertheless, when searching for a cool pair of baby shoes, you ought to remember the fact that most babies will be kept either in your arms or in their strollers, meaning you won’t require harsh soles. Moreover, you won’t be spending too much time outside during the first months of your baby’s life so that you won’t need special winter boots or sneakers. Before buying any pair of baby shoes think about how much your baby will be spending standing on its feet. If the answer is little to none, we do not see the point in buying anything else but mere cover-ups with cute designs. Size is also significant when looking for baby shoes, especially since children have a rapid development and sometimes can even skip a few sizes. Thus, it is advisable to always buy shoes 1-2 sizes larger if you are planning on using them more than a couple of times. However, we do not recommend buying shoes which are too big either because they may end up distorting the walk of your baby and cause feet problems later on. For a better fit, we suggest you constantly measure your kid’s feet size and buy accordingly. A size bigger for boots and trainers is recommendable, sometimes even two sizes up for boots worn in winter with thick socks under. However, sandals and other summer season shoes should be bought according to the child’s size. Moreover, there is no point in stocking up shoes over the seasons as children have irregular growing rates and periods. Thus, if you buy a pair of boots one size larger considering they will fit just right by the time your baby meets the winter, you may be surprised to find out that they don’t fit well. In other words, stick to seasonal shoes and avoid buying a pair of shoes for the upcoming seasons. Another important aspect to bear in mind is the fabric of the shoes. Children have extremely sensitive skin, thus dressing them with synthetic fibers filled with chemical dyes could determine severe allergic reactions such as skin rashes, redness, blisters, and itching. Thus, we suggest you choose natural and breathable fabrics like cotton and pure leather or suede. Letting your baby’s skin breathe during summer is a must, so you should avoid overdressing and adding socks. In exchange, opt for leather sandals worn on bare feet, as well as suede moccasins. These fabrics will allow proper ventilation and avoid excessive perspiration and friction which can, again, cause rashes, itches, and blisters. Orthopedic shoes are a must for your baby’s first steps, and the market is full of fun, cool and colorful shoe combinations which will help your child develop his feet and legs. However, make sure to buy orthopedic kids shoes from reputed retailers and avoid products with extremely low prices. A pair of good orthopedic shoes for your baby can cost up to one hundred dollars, sometimes even more, but these will set up the trends in your baby’s future development and will ensure an easy, stable and right legs and feet position during walking. We consider these to be the best options available on the market for your child’s first steps and walks. On the other hand, we think that it would be best to avoid sneakers and running shoes for awhile, at least for up until your baby can walk on its own, without requiring help. Most of these sneakers, trainers and running shoes come with flattened soles which could later lead to orthopedic problems such as a flat foot. The soles on baby shoes should be rigid yet flexible at the same time, but still, consider the anatomically correct feet contours in order to sustain and keep the foot steady. Therefore, we suggest you invest a little more in your baby’s pairs of shoes as they may have a great impact on the overall development of your child and could lower the appearance of orthopedic complications in the future.